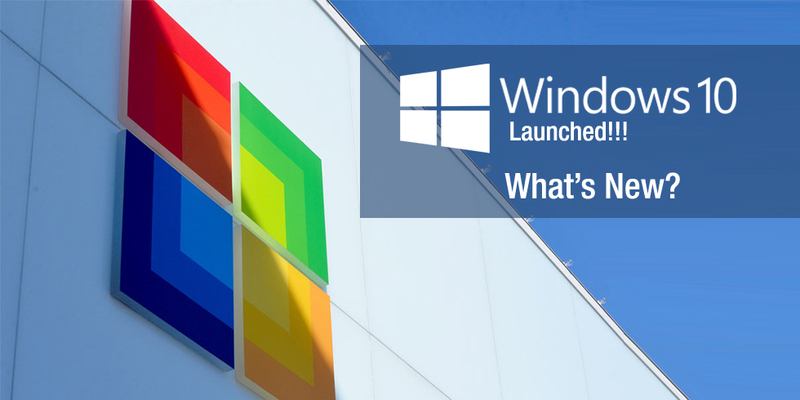 Windows 10 Launched - What's New? Check it out! Windows 10 Live – What’s New? On Wednesday, 29th July 2015, Microsoft unveiled its all new Windows 10. The upgrade to its existing operating system has been the talk for a while now. It released in 191 countries simultaneously, and was warmly embraced by one and all. The upgrade is not restricted to new features and functionality; it has moved on to upgrade the delivery by coming up with Windows as a Service. This will definitely cause a huge impact on the way Windows is developed, delivered and used in the future. Microsoft has finally realized the power of its own products, and enhanced it further offering many capabilities to the developers, which will be eventually transformed into an incredible user experience. With the new upgrade, Windows has made targeting the latest version of the operating system easier as compared to earlier. You get a free upgrade to Windows 10, if you are working on Windows 7 or other higher versions. Secondly, if Windows has been installed to your device, then you get a lifetime of free upgrade to the latest running version of the operating system. In case of home version of the operating system, this update becomes automatic and mandatory. Windows constantly updates its operating system, without indulging in new releases. This is why, the free and automatic upgrade will help developers target the latest version, and close the gap between users and app versions. This is going to impact the whole system in major way. OF course there are other features and functionalities that should be looked at too. Finally, Microsoft has realized the power of its Windows operating system. In the not so far away past, Microsoft had defined different APIs and kernels for the different platforms. The operating system stacks were different for mobile, desktop, and xbox before Windows 8 was released. Desktops operated on Windows NT Kernel, mobiles on CE kernel and xbox had its own special kernel. With Windows 8, phone and desktops were based on Windows NT kernel. Xbox one was converged to the phone and desktop by switching it to the same kernel. Of course, application platforms and APIs possessed different stacks, and the convergence was still a bit confusing, especially for the developers. Windows 10 will actually ring in convergence in its true sense. All devices will be based on the same kernel, ‘universal windows hardware’ combined with ‘standard network and I/O’. This support from Windows Core has been expanded to the devices currently running on Windows technology as well as the devices that will be set on Windows in the future. The core will also be applicable to the Raspberry Pi2 as well as the new HoloLens It is not just the hardware that has been consolidated and converged on Windows 10; this has been extended to the software too. The different development SDKs across the different platforms have also been unified with the Universal Windows Platform. What is UWP? A layer of APIs, which will be available across the different devices like Mobiles, tablets, computers, Xbox that use Windows operating system. Even devices that are in the pipeline will contain this layer. Of course, you can differentiate the platforms by including platform specific features using the extension SDKS created specifically for the individual platforms. What’s the benefit of this UWP? You don’t need to create platform specific apps, or even test them. 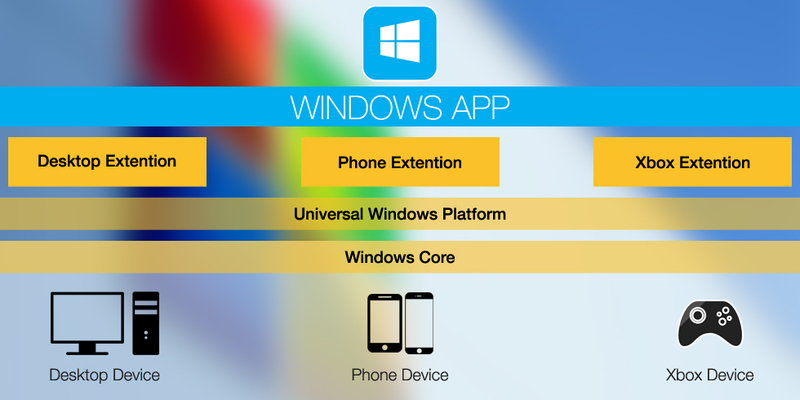 The same app can run across platforms, by using the UWP as well as the features specific to the different platforms. You have APIs that will help you acknowledge the presence/absence of platform specific features. Earlier, such checks were allowed only during the compilation mode. But, with runtime checks applicable, developers can create codes that can adapt to a specific device. This modular approach that Microsoft has enabled simply means that a phone that needs to be powered to give out a desktop experience needs a UWP combined with mobile and desktop extensions. The future of modular approaches would be hybrid and more powerful devices. These are some of the power packed sources that will help the developers. What is going to enhance the overall user experience? Have you ever been bothered while searching for something, either on your PC, cloud or on the internet? Cortana, which was first launched on the phones with Windows 8.1, will now surface on the desktops with Windows 10. With a little personal information, this assistant will search for information you need, help you with all the tasks that need to be performed, and sort all the information you need. Basically, you can use this assistant for app related, cloud related or internet related tasks. Well, your assistant plays good music, and helps you keep a check on reminders too. The Integrated Xbox App is Microsoft’s incredible response to Sony’s PS4. With this new app, you can stream any Xbox One game to any device operating on Windows 10. Of course, you will need to be using a similar platform, but this is definitely a huge breakthrough. With the app, you can stream through activity feed, messages as well as friend’s list. You can even get information on games from third party clients.